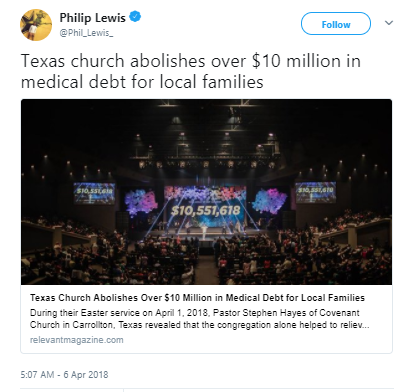 A Texas church raised $100,000 and donated the money to RIP Medical Debt, a charity that buys and forgives medical debt, which helped pay off more than $10 million in medical debt for more than 4,000 families in the Dallas area. Covenant Church in Carrollton, Texas, partnered with the nonprofit group, which acquires unpaid medical debt at incredibly reduced rates and forgives it. For each dollar donated to the group, the group pays off $100 in debt. In total, $10,551,618 in medical debt was eliminated for 4,229 households in the Dallas area. That means that every veteran within a 20-mile radius of Covenant’s four campuses who had debt had their bills paid. “While introducing ourselves as a local church to these families, we also showed them that we aren’t trying to get something from them — but rather give something to them,” said Pastor Stephen Hayes in a statement to The Stream. “Not only is the debt itself gone and paid, but also, any negative impact that debt has had on their credit history is wiped clean,” Hayes added. When Hayes was 17 years old, he was struck by a vehicle while crossing the street. He spent 12 days in intensive care and was in a coma. However, when he awoke, his family was inundated with medical bills. The church banded together and helped pay his debts, which inspired Hayes to make debt elimination a community outreach program for the church. Hayes said that he believes Christians should be working on efforts such as his own. “We began to ask the question, If our doors closed tomorrow, would our city even notice? If [local families] fall on hard times, we want to help get them back on their feet as soon as possible,” Hayes told The Stream.